← There's a party going on! Every once in a while, Shaun will do something unexpectedly wonderful that reminds me why I have kept him for so long. Something really marvelous such as getting up early to take KT all the way into Seattle for her work at the aquarium and letting me sleep in. Ah…bliss! When Shaun came home from his excursion, he proudly announced that he had gotten me a cinnamon roll as a treat. Now, I’m sure you know what cinnamon anything is right up there with chocolate and coffee in my Book of Delights. But, to be perfectly honest, when Shaun stops for treats he goes to a local grocery store which is the one place that we know of that has crullers. (which Shaun adores) While the crullers are perfect, the cinnamon rolls are rather mediocre. To my complete delight, what Shaun brought home was not a grocery store cinnamon roll. I had no idea where this little bit of perfection had come from…it really didn’t matter. I was too busy savoring it. I seriously can’t recall having something this wonderful in all of my life. It was pure decadence. When I had completely licked my plate clean (Oh yes I did!) I realized that it did matter to me where the rolls had come from. Not wanting to simply ask Shaun where he had gotten my new favorite treat, I went snooping. In the trash can. I found a box (No, I didn’t lick the inside of it!) 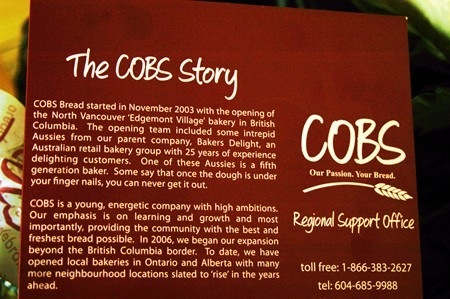 that said COBS. Hmm….how interesting that Shaun would stop in some uptown bakery. Intrigued, I decided to read the box. 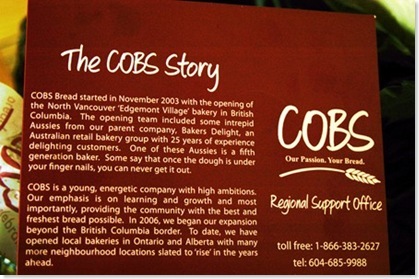 (Oh that delightful aroma…I swear I didn’t lick the inside of hat box) It turned out that Cobs is a Canadian bakery! Now, my sense of direction is a bit wonky, but even I can figure out that the Canadian border isn’t on the way home from downtown Seattle! Those look divine! For someone who is on a mission ot lose a few before spring break, well….I guess it helps to just drool over my keyboard! I love cinnamon rolls from the Cinnabon here at the mall. They look just like that. What a lovely man you have! Oh YUM!!! I can almost smell the cinnamon!! And the cup is lovely, too!! Maybe those came from a display at the front of the grocery store? Kind of like Krispy Kreme? I know Cobs. I have to close my eyes when I’m close to it. Yum! 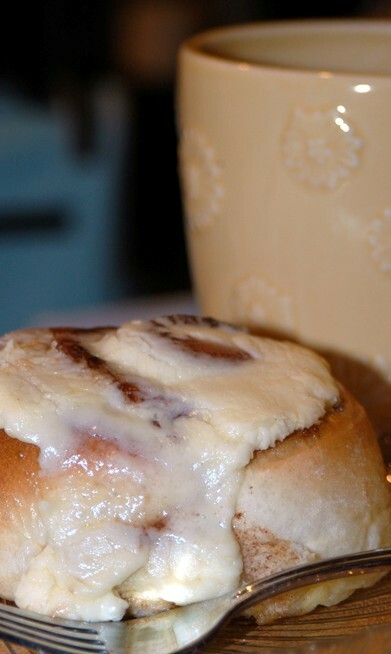 I could go for a cinnamon roll right now…. I wonder if they do apple fritters? That’s my donut of choice! Sounds like a perfect Sunday morning. Hilary~Don’t do it! It’s an instant addiction! Mrs. D~You know…I’ve only seen Cinnabon at the airport. And that’s probably a good thing! Mrs. G~It’s a dangerous place. Beckie~Me too…only they seem to be all gone. Jenn~ Forget about the apple fritters…the divine cinnamon roll is all you need. Now I’m jealous! Can’t get anything like that over here! They do have what they call donuts over here – the shops are in the mall – of course. I hear that one of them usually has a line an hour long. I’ve had a donut from one of the shops over here and it is NOTHING like a Shipley’s donut from back home. Nothing I’d wait in line for an hour for that’s for sure. They do have Dunkin’ Donuts in Mayalsia. I think it’s all because the Chinese don’t eat sweets like we do. Their desserts or pastries have like red bean paste in them. They have bakeries but most items are not sweet. They have like ham and mushrooms, cheese, that sort of thing. And they are sitting out – I’m not eating anything premade with meat that isn’t refrigerated. Ahh, crullers! Brings back memories of my childhood! Oh.my.gosh. I gained 10 pounds just looking at the picture of that marvelous, decadent, delicious, gooey, scrumptious cinnamon roll. Are you sure you didn’t lick the box?!!! I would have! 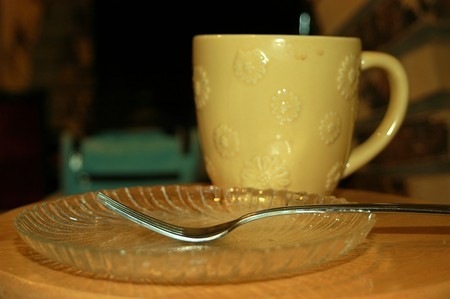 I LOVE that you ended the post with the empty plate – what a perfect touch. Ummm cinnamon roll – now I’m hungry. Funny you should talk about licking the carton…I had a double dip hot fudge sundae last night and I swear, if I could have fit my face down into the cup it came in, I would have licked that bad boy clean, too. lol Hmmm, hmmmm, hmmmmm. I thought I was pass these silly cravings (almost 24 hours past!!!) but now you’ve gone and shown me this cinnamon roll. Dang it. I’m off to raid the fridge. I’ve really got to quit reading blogs at night…..
this is sweetness!!! & the drool factor on that photo is quite high. Oh, wow!!! That looks and sounds really good! I love cinnamon rolls with raisins.